This message was channelled by Kay from The Circle of The Light of The Love Energy. All steps on the pathway to enlightenment are to be taken knowing that the faith you have will be steadfastly guiding you through. All happenings in life need to be accepted with love, then all will be resolved with love. This message will be included in our new book “Love Is The Key”, and which we hope to publish in February 2012. Kay wrote this spiritual poem on 2 July 2011. As Kay has never written any sort of verse before she believes this writing is being channelled from her guides. Then the heart and soul will sing with love. If all of humanity followed these principles, no doubt the world would be a better more peaceful place do you think? This verse will be included in our new book “Love Is The Key”, and which we hope to publish in February 2012. Kay channelled this message from The Circle of The Light of The Love Energy in February 2010. It is included in our book Earth Messages of The Love Energy. Everything happens as and when it’s supposed to. It may not seem like that to you! There is a purpose for every event – teaches you many things from lessons of learning, understanding, needs of others too, feelings of your own. Patience is required in many situations and is a necessary learning for further development. Remember to be not only patient with the situation, but also to be patient with yourself. One cannot expect to learn and be all things to all people, all of the time. You can only give what you can to a situation. You do need to apply patience. Every situation has a purpose for those involved. The people that it directly relates to have learning. The people who support those people have learning and the people who are closely associated with that whole network also need to allow patience and understanding to flow. I said to you to remember to be patient with yourself. Do not chastise yourself if you feel you have not allowed the patience required for a situation. Remember to learn from the situation. Patience is not an easy thing because so many things are happening at the same time, around a situation, that need to be dealt with as well. Just remember to learn from every situation. Give as much as you can – at the time. Be as patient as you can. Consider the person, consider the surroundings, consider yourself. That is all we ask! Courage comes in many forms. Some may need to use their courage to leave their house, others to climb a mountain. Respect the courage shown no matter the task, because there is a display of faith to undertake a task that is masked by fear. Doubt in one’s self causes the doubt and therefore the fear. Release all fear to the White Light of the Divine – show courage by doing this. Trust and believe that all things can be overcome when you acknowledge and accept that the loving, powerful God that lives without, also lives within you – then all things are possible. Physical mountains don’t need to be climbed to show courage, but the mountains that you have in your mind need to be released to the White Light to be overcome and this takes faith and courage. Not all acts of courage show the heroism that one on Earth associates with courage. Remember to always follow the Light – this will help every aspect of your life. Show courage and believe in the God without and the God that dwells within you. Please tell others who might be interested in our website. Kay wrote this spiritual poem on 13 January 2012. As Kay has never written any sort of verse before she believes this writing is being channelled from her guides. This verse will be included in our new book which we have now decided to call “Love Is The Key”, and which we hope to publish in February 2012. Kay wrote this spiritual poem on 12 January 2012. As Kay has never written any sort of verse before she believes this writing is being channelled from her guides. So listen, for the sounds that float in the air with ease. So watch for visions of unity that can be seen with ease. So take nurture from the bounty that can be had with ease. Your tree of life stirs, empowered, ready to reign and please. This verse will be included in our new book which we have decided to call “Love Is The Key”, and which we hope to publish in February 2012. Peter Ashley and Kay Meade are Reiki Master Teachers who practice and teach the ancient Reiki energy healing method in Paraparaumu, Kapiti Coast near Wellington, New Zealand. We are also close to Paikakariki, Otaki and Waikanae. We offer Reiki training (Usui method) and attunements at beginner and advanced levels. Enjoy a relaxing and peaceful Reiki treatment or learn to give yourself and others Reiki treatments. We are members of Reiki NZ Inc. 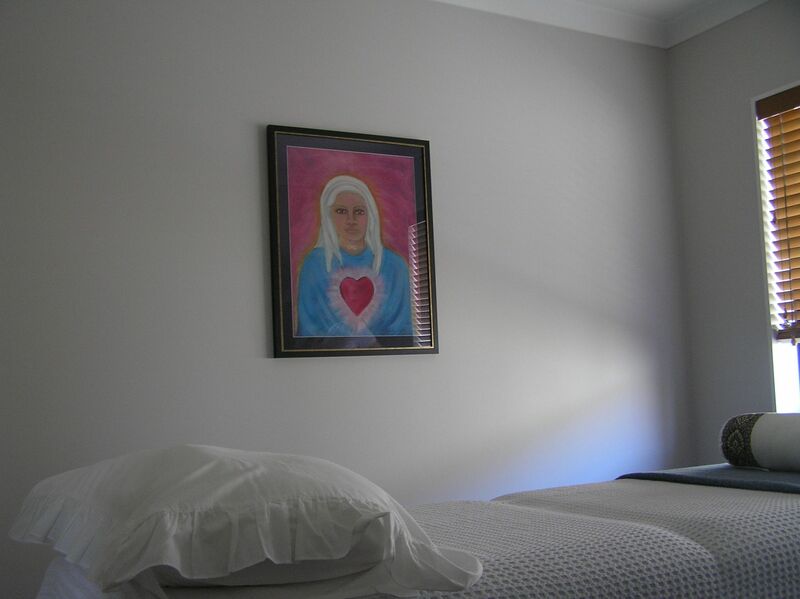 This is our peaceful room where we practice Reiki. Reiki is a very gentle energy based healing method. The patient lies on a massage table fully clothed and the practitioner lays their hands lightly on the patient in a pattern of hand movements. The patient may feel heat, cold, pulsing or vibration from the practitioner’s hands and may see colours when their eyes are closed. The patient will usually feel very relaxed and often sleep during the treatment which usually takes an hour. It is often recommended that you learn Reiki so you can treat yourself each day as well. Further information about Reiki is available on the Reiki NZ Inc. website. We offer training and attunement at the Reiki First Degree (beginner), Reiki Second Degree, and Reiki Third Degree (Master) levels. Training is usually on a one-to-one basis. To arrange a Reiki treatment or training click here to visit our ‘Contact Us’ page. Details of our services and fees are set out below. “I recommend Kay and Peter for the sincere, caring and professional manner in which they impart their healing. Having received Reiki from Peter on a number of occasions I would sincerely recommend it. I always find I have calmed down and stopped rushing about afterwards – not easy to do in these busy times. I also experience beautiful colours and the thoughts which come to me are often very pertinent to what is happening in my day/life at the time” . Heather, Paraparaumu. All training is usually on one-on-one basis. Student materials and certificate are provided. Ends with a Reiki session for the student. Certificate, student manual, chakra chart and Reiki Lineage. Certificate, student manual and Reiki Lineage. Kay channelled this message from The Circle of The Light of The Love Energy in April 2010. It is included in our book Earth Messages of The Love Energy. The Light within shines brightest when all is in harmony: body, mind, spirit. Ensure all ingredients for harmony by allowing forgiveness from the heart. For all people and situations that interact with your beingness – forgiveness from the heart, no matter the cause, brings the deepest sense of wellbeing to the Light within. Harbour no ill feelings, resentments, hatred – as this will stunt the spirit’s progress and negate the Light. Open your heart and allow forgiveness. Progress the spirit through forgiveness. Bring all of the beingness in harmony through forgiveness. Kay channelled this message from The Circle of The Light of The Love Energy in early 2010. It is included in our book Earth Messages of The Love Energy. Events of significance are passed on and form the history of learning and evaluation for those who follow. Those who seek the truth will find the answer within themselves and that reference material they access in search of the answers will be but a steering star to their inner wisdom. The God Force is within as well as without – all around, fully encompassing. Recognise, accept and feel the God Force within and you will be at one with everything and energy of the purest kind will emanate from you. Love yourself as you are; accept all others as they are, for they too are carriers of the God Force. When all accept and acknowledge the God Force – all will be united by love. The power of love will reign and all will be well on Earth.